This bracket is designed to hold either a flag at 45 degrees, or a banner horizontally. Finished with a thumbscrew to secure your flag. 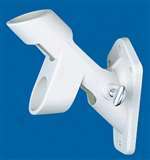 Available in aluminum, white aluminum or white nylon.